Solution Guidance Corporation is a Premier Solution Provider of enterprise class applications focused on total project management control for large organizations and government agencies. 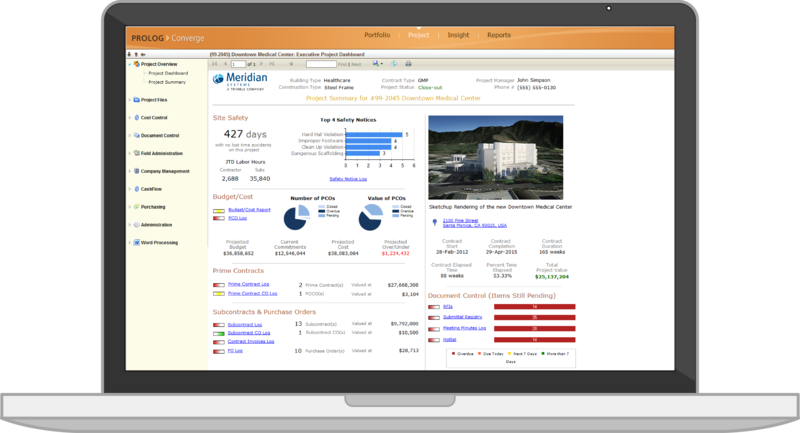 We are proud to offer solutions from Meridian Systems’ Prolog® Application Suite. Prolog® software delivers construction project control and transparency to project-based organizations within AEC, Commercial and Public sectors. Prolog streamlines operations for engineering and construction firms managing several projects, public agencies implementing a capital bond program, or private building owners constructing a new facility. Our Desktop, Web and Mobile solutions allow contractors and their teams to work online or offline, and in the office or out in the field. With Prolog®, you can work from anywhere, anytime. Bring your entire project team together, in a real-time, online construction project management environment. Increase user adoption within your organization through a construction-specific solution and role-based user interfaces. Make decisions quickly using up-to-date project data from field workers using Prolog’s mobile applications. Increase efficiencies by enabling interoperability between Prolog construction project management and your other critical business applications. Create end-to-end business solutions with an extensible, interoperable Web services platform that allows diverse systems and organizations to work together. Benefit from tomorrow’s technology today by integrating Building Information Model (BIM) data with your project management system. "Solution Guidance Corporation has been providing outstanding services. Your staff’s in-depth knowledge of the technologies are evident and that has been a huge value-add during our implementation"